Our President Shri. Raja M Shanmugham along with Our Treasurer Shri. P. Moghan meet Smt. 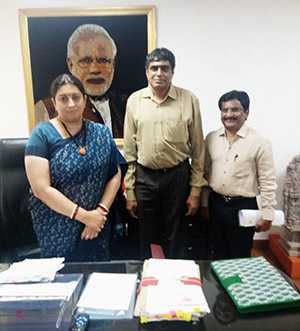 Smriti Zubin Irani, Hon’ble Union Minister of Textiles Yesterday (14th June 2018) in New Delhi and requested for increasing Duty Drawback Rate, ROSL rate, Interest Equalization Scheme rate to bail out the knitwear exporting units out of the crisis and explained the need to have FTA, CEPA, CECA expediently to have a level playing field in the global market further to increasing of Chinese investment in our neighboring countries. The Hon’ble Minister has assured to address the concerned issues at the earliest.